When you have acquired your own business premises and land, it is inconceivable at the time to think anyone could take it away from you without purchasing it. However, under the law of Adverse Possession, that could be a possibility. The law of Adverse Possession comes into play when an individual party has been using your land as their own for a period of 10-12 years. This party can then claim the land that they have been using, the title deed will then transferred to them under the law of adverse possession. 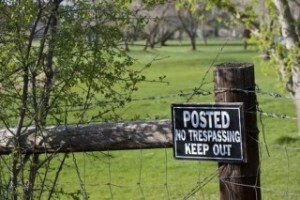 Often, this occurs as a result of mistaken or misunderstood boundaries, but some parties will maliciously set out to occupy and use a certain area of land for 12 years in order to claim adverse possession. When you own a commercial premises, especially if it is a large one, it can be hard to know what is happening across every inch of it every day, and unfortunately that is why you will find that most adverse possession cases occur on large commercial premises, such as farms, housing developments, or large building yards. This is not something that you want to think about when buying or acquiring your commercial premises. At Sam Hawking Property Lawyers, we have been dealing with all aspects and issues surrounding commercial property for years. Our experts can offer clear and practical advice for all cases of Adverse Possession, and we have vast experience in a variety of different commercial sectors; whether that is large, national corporations, smaller local businesses, or independent businesses owners. We know that no matter what type of business you may have, your commercial premises is an essential part of what makes your business successful, and you cannot afford to lose any part of it. There are a number of criteria that must be met in order to claim Adverse Possession, and each element must be in place before anyone can claim ownership of your land. However, from experience we advise that you should not linger in opposing a claim of adverse possession, and never assume that your title deed is safe or a claim is unfounded – or you might find yourself without part of your property. Our commercial property experts regularly deal with a variety of title cases, and will be able to advise the best course of action in order to silence the claim as swiftly as possible. We are aware that a lot of people will not know how the law of Adverse Possession works until they find themselves facing a claim, but we will make sure that we can guide you through the process to a place of security for your premises.